But we train farmers and staff at partner organizations, too? Our agropreneurship team trains both farmers and non-governmental organization staff on best practices in agriculture and business – or as we like to call it, “Agropreneurship.” Thanks to their incredible work, KickStart is able to reach more people than ever before, scaling our impact across a wider geography and equipping farmers for long-term success. Our trainings encourage participants to take up irrigation and introduce brand-new, never-before-seen technologies to some of the toughest customers in the world: Small-scale farmers in Africa, who are entrepreneurial but risk-averse, hard to reach, and have limited resources. Meet Edmond Nyeko from Uganda – a former schoolteacher, and now a farmer. Edmond had tried growing groundnuts on his small farm, but lost a lot of money after a dry spell. He asked one of KickStart’s partners for help, and they referred him to our agropreneurship program. Through his participation, Edmond learned new and practical skills in agriculture, business, and finance, and gained back his confidence as a farmer. He bought his very own MoneyMaker irrigation pump from KickStart and within just months, he was running a profitable farming business – earning over $4,000 that year, and growing an abundance of tomatoes, cabbages, onions, and other crops. His success has catalyzed a drastic change in his way of life: he can afford to send his son to high school for the first time, and has left teaching to farm full-time. 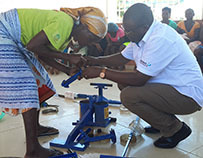 Edmond gives back to his community by lending the pump to his neighbors, who hope that one day that they too can make enough money to buy their own pumps. Already, KickStart has trained over 7,000 farmers in agropreneurship since the program began in 2015. They are growing more robust and sustainable crops, and have found new confidence and prosperity for their families and communities.